Daucus carota 'Purple Kisses' is a large flowered chocolate coloured Queen Anne’s Lace that has been an absolute hit from day one. The lacy flowers appear in shades of old rose-pink, through burgundy to chocolate. Up to a thousand tiny flowers are produced in delicate, lacy, flat-topped, two- to four-inch clusters. They look great en masse and the plant pairs well with almost anything in the garden or in the vase. The plants bloom for most of the summer from just one planting. Essential in the cutting garden, 'Purple Kisses' are spectacular when used in mixed bouquets or simply arranged in a great cloud of their own. The lacy umbels come in a range of sizes and shades, from the palest old-rose through to dramatic dark chocolate, the blooms last up to 10 days in the vase and add a dramatic, airy quality to finished arrangements. Daucus carota is good plant for landscaping and can be used in meadows and wildlife gardens, where it is adored by bees and provides a wonderful host plant for butterflies. The plants grow to a height of around 80 to 100cm (30 to 36in), with a spread of 40cm (16in). Flowering will usually continue well into the autumn, even after blossoms have died off and seed pods have started to form. As the seeds ripen, the seed head curls inward to form a 'bird’s nest' shape and turn brown. A small bristly seed is produced at the end of each flower stalk, and once dry they readily latch onto fur or feathers to be disseminated beyond where the seeds would otherwise fall. Daucus carota is easy to grow from seed. For earlier plants, the seeds can be started indoors in trays 6 to 8 weeks before last frost and the seedlings transplant out after all danger of frost has passed. The plants are best when sown directly where they are to grow in late spring to early summer or in autumn, as with its long taproot, this plant often does not transplant well. Choose a weed free position in full sun on reliably moist, well drained soil which has been raked to a fine tilth. Sow the seeds thinly at a depth of 1cm (½in). Germination will take 10 to 20 days.The seedlings might be mistaken for grass seedlings at first, as the cotyledons are linear, but the next set of leaves is more distinctive. When large enough to handle, thin out the seedlings to 10cm (4in) apart. Water regularly particularly during dry periods until well established. This biennial plant forms a basal rosette of leaves in its first year and an erect flowering stalk the second, flowering occurs from June to September although some plants may act as an annual and flower in the first year. Pick when flowers have fully opened and are laying flat. If harvested much earlier, the stems have a tendency to wilt. Fresh flowers will last 6 to 8 days in the vase. Flower preservative is recommended. Queen Anne's Lace is a host plant for Swallowtail caterpillars. Many butterflies, adult bees and beneficial insects utilise the flower nectar. Starlings are known for selecting vegetation with which to line their nests, and the wild carrot is one of their choices - it contains the steroid B-sitosterol, which kills off fowl mite. How the starlings know this is a mystery! Known as Daucus carota, Queen Anne’s Lace is actually a wild carrot; a quick glance shows the similarity in the ferny foliage. Dig one up and crush the root and you’ll also smell the similarity. In the 15th century, Dutch horticulturalists developed a thicker, sweeter root and exported the carrot to England where it became a popular vegetable. Today it’s known as Daucus carota var. sativus to distinguish it from its wild relative. John Parkinson’s famed “Paradisus Terrestris,” published in 1629, says the roots boiled in salted beef broth “are eaten with great pleasure because of the sweetness of them.” Sounds like the beginnings of beef stew to me! Parkinson goes on to talk about the fashion of wearing the foliage of Daucus carota in place of feathers on sleeves and hats. Since Parkinson was herbalist to Queen Anne’s husband, James I, the link between the plant and the Queen seems clear. And paintings of the era show Anne wearing lace as exquisite as the flowers that bear her name. Like many of our native plants, Daucus carota is truly beautiful in a wildflower meadow, but does self seed readily. Do not plant in areas where farmers produce carrot seed because it hybridises with the crop and ruins the seed. 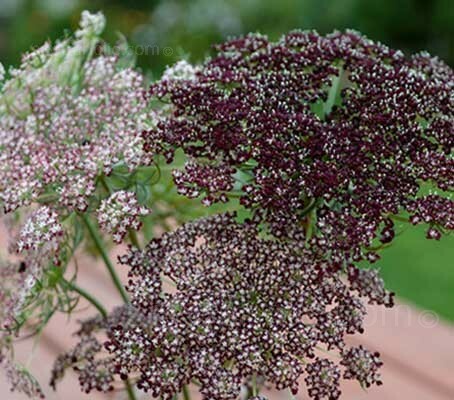 The genus name Daucus derives from daukos, the name given by the Greeks to some members of the the Umbelliferae family. It seems to derive from daîo meaning 'I overheat' . The species name, carota originates from the Greek word carotos meaning carrot. 18th-century English courtiers used the flowers as 'living lace'; and supposedly because Queen Anne challenged her ladies-in-waiting to a contest to see who could produce a piece of lace as beautiful as the flower, but none could rival her own efforts. Another legend refers to the purple flower in the centre, being that Queen Anne pricked her finger with a needle and shed a drop of blood on the plant. A more gruesome story refers to the earlier Anne Boleyn (1507–1536), the beheaded wife of King Henry VIII of England. The white flower cluster representing the lace around her neck and the tiny purple flower in the centre representing the point of decapitation!